Source water – the lakes, rivers and underground aquifers that are the source of our water supply, fed by rain and melting snow. Water treatment – the processes to filter and purify water so that it is safe for human use. 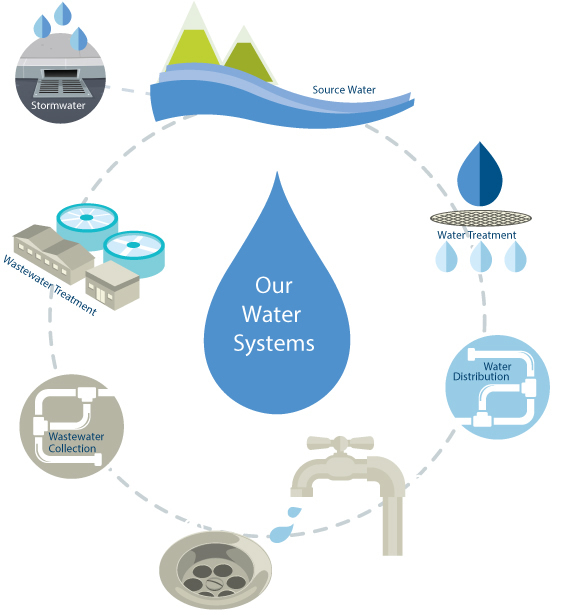 Water distribution systems – the pipes and pumps that deliver clean water to our taps. In BC there are more than 32,000 km of underground water pipes – that is enough pipe to circle 80% of the way around the earth! Wastewater collection systems – the pipes and pumps that take away used water from our toilets, drains, bathtubs, and laundry. These are also called sewers. In BC, there are over 26,000 km of municipal sewer pipes underground – that is enough pipe to circle two-thirds of the way around the earth! Stormwater systems – the pipes, ditches and natural systems that channel our rain water and snow melt away from our homes and businesses and back to the natural environment. In BC there are over 20,000 km of stormwater pipes underground – that is enough pipe to circle half way around the earth! In British Columbia, 91% of residents get their water from municipal water systems, 8% get their water from private wells, and 1% get their water delivered by tanker trucks into holding tanks. 86% of the water that feeds into municipal water systems comes from rivers and lakes – these are called surface water sources. 14% of the water that feeds into municipal water systems comes from underground aquifers – these are called ground water sources. In municipal water systems, water is withdrawn from the water source and treated before it is pumped to our homes and businesses. The quality of the source water determines the type of treatment method. Most systems will include several stages of filtration (to remove suspended particles, debris and algae) and disinfection (to remove bacteria and viruses and purify the water). Disinfection methods include chlorination and treatment with UV (ultra violet) light. After treatment, municipal water systems distribute water to homes and businesses in large pipes called water mains that are usually buried under our roads and sidewalks. Water mains are maintained by our local governments, and paid for by water rates and property taxes. Water in municipal systems is required to meet strict water quality standards established in provincial regulations, and is tested regularly to ensure that it is safe to drink. In British Columbia, 86% of residents depend on municipal sewer systems to take used water away from their homes and businesses, 13% of residents collect their used water in private septic systems, and 1% of residents get their used water hauled away. Used water from sewer pipes is pumped to wastewater treatment facilities, where it is treated before it is released into the environment. The treatment method that is used is affected by the types of contaminants in the sewage, the receiving environment for the treated wastewater, and the effluent requirements established in local, provincial and federal regulations. This stage of treatment removes grit, like sand and gravel, egg shells, coffee grounds etc. from raw sewage. 12% of municipal sewage in Canada receives no treatment or preliminary treatment before it is discharged into the environment. This stage of treatment starts with temporary holding of sewage to allow the solids to sink to the bottom, and oil and grease to float to the top. The settled and floating material is removed, and the remaining liquid is moved to the next stage of treatment or discharged to the environment. 30% of municipal sewage in Canada receives preliminary and primary treatment before it is released into the environment. This stage of treatment removes dissolved and suspended biological matter and the remaining liquid is moved to the next stage of treatment or discharged to the environment. 51% of municipal sewage in Canada receives preliminary, primary and secondary treatment before it is released back into the environment. In this stage of treatment, water is treated with chemicals and filtered prior to being released to the environment. 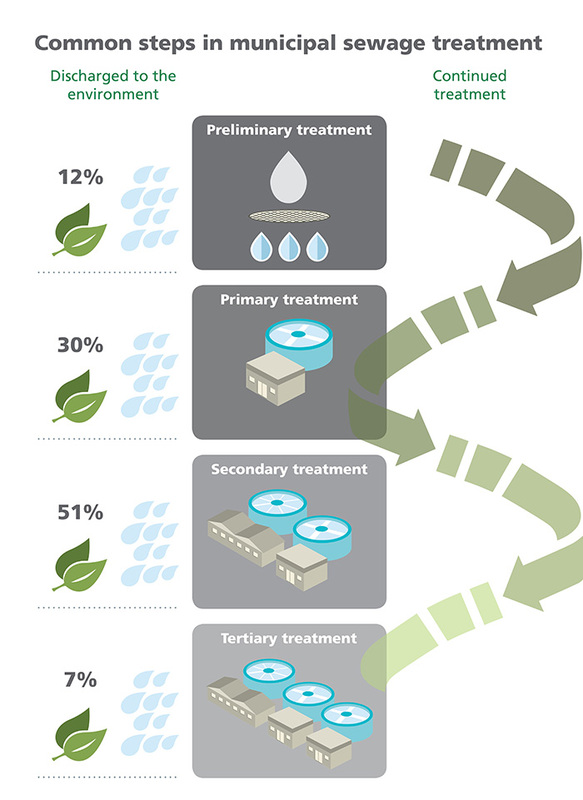 7% of municipal sewage in Canada receives preliminary, primary, secondary, and tertiary treatment before it is released back into the environment. We can all protect our sewer systems. TAKE ACTION NOW! We can all reduce the impact of stormwater. TAKE ACTION NOW!